Rock Follies, and its sequel, Rock Follies of '77, was a comedy musical drama shown on British television in the mid-1970s. 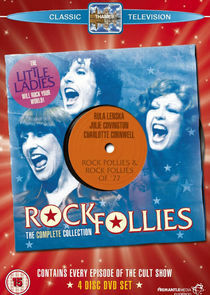 The storyline, over 12 episodes and two series, followed the ups and downs of a fictional female rock band called the "Little Ladies" as they struggled for recognition and success. The series starred Rula Lenska, Charlotte Cornwell and Julie Covington as the Little Ladies, with support from Emlyn Price, Beth Porter, Sue Jones-Davies, Stephen Moore and Little Nell among others. The series was made with a very low budget for Thames Television, with a style inspired by fringe theatre.